-> Make sure the window gets maximized on the correct monitor - the one that has most of the window. Windows that are too big to fit a given screen can still get the window maximized. For windows maximizing on the wrong workspace, see bug 776435 instead. I have a notebook, using it with an external monitor attached to it in a dual-screen setup (See attached screenshots, the little screen is that of the notebook, the large screen is that of the external monitor attached to the top of the notebook's screen. 1) the maximized windows always end up on the large screen, all the same if it was originally on the smaller one. 2) their top window-frame-bar (containing the minimize-maximize-close buttons) ends up on the top of the small screen. See screenshots: Screenshot-1 is showing the situation before maximizing, Screenshot-2 shows the situation after maximizing. I am not 100% sure, but I guess this is only this way since my last natty update. - When a user maximises a window, the window should always maximise on the the monitor that contains the majority of the window at the moment the user gives the maximise command. I have the same problem. Laptop monitor is under my external monitor. Maximising window is always switching to my external monitor. Second strange behavior is crashing windows while resizing on my bottom (laptop) monitor. I also use vertically-stacked dual monitors, however I do not see the odd maximisation behaviour. I suspect it is significant that the two screens have the same width, but different heights (1280x800, 1280x1024). However, I do see the issue with maximised windows in the secondary screen disappearing under the title bar. This appears to be broadly similar to #707346 (the same issue, but in gnome). I experienced this problem with natty, but after upgrading to oneiric it has disappeared. I hope this is solved for good. A similar problems happens with 12.04, when trying to maximize windows who are larger than the display you want to maximize them on (but will fit on the other display), these windows get maximized on the other display instead. That's pretty counterintuitive to me, windows should just be resized to fit the resolution of the display. This problem is indeed present in Quantal, it appears to only affect people using a dual head setup when one screen is smaller than the other. This effect is most annoying when working with many open pdf documents, moving them from large to small with snap fails so I have to use the compiz move window plugin and reach for the keyboard every time. Not great for workflow really. This happens in Precise too, but I think it's not only related to having monitors with different resolutions, in fact sometimes the window is correctly maximized to the smaller monitor. The bug is triggered when you try to maximize a window that is taller or larger than the monitor you're trying to maximize the window to, such when you drag a maximized window from a bigger monitor to the smaller and the automatically restored unmaximized window size is bigger on one of the two dimensions in respect to the monitor you're dragging the window to. Seems there's a simple flaw in the governing logic, hope will be fixed soon and the patch backported to Precise. I have found a workaround (Because Ubuntu12.04 still doesn't have the fix commited for now) . You must use the keyboard and the mouse. Maximization (both snap and through window buttons) works if the window you're maximizing can fit into the smaller screen, otherwise immediately goes into the bigger screen. Tested with both wide and tall windows, all small windows (that fit into the smaller screen), can be maximized correctly. 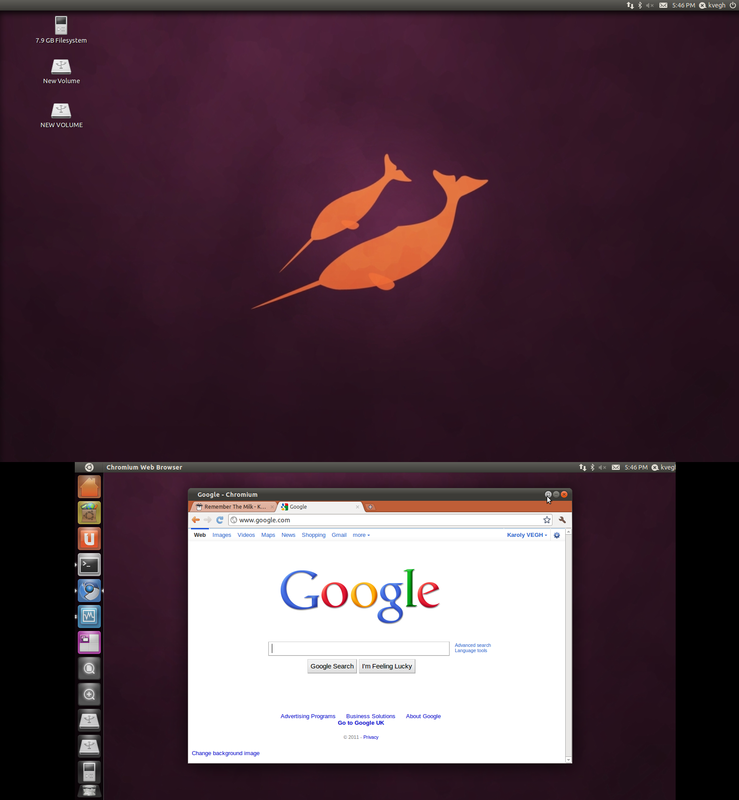 Confirmed on Ubuntu Precise 12.04 LTS. Workaround described in post #10 works fine here. Regression? Did it ever work? What release? Working in 11.10 updates → 1:0.9.6+bzr20110929-0ubuntu6.1. What's also problematic here is that the window maximize preview is not on the display that the window ends up maximizing to. 1. Put a small display (laptop screen) on the left, and a larger display (monitor) on the left. 2. Resize a window in the larger display so that it fills the display, but isn't maximized. It should be larger than the smaller display. 3. Clicking the window's title bar, drag it to the top of the smaller display, and notice that the maximize preview is on the smaller display. 4. Let up on the cursor, and notice that the window maximizes to the larger screen. 1. Put one display on the left, and one on the right. 2. Dragging a window by the title bar, move the mouse so that it is to the right of the border between the 2 screens. The window snap preview will show the window snapping to the left side of the right screen. 3. Without letting up, continue to drag the window to the right side of the left monitor. The window snap preview will not move. 4. Let up on the mouse, and notice that the window maximizes to the right half of the left screen even though the preview is on the left half of the right screen. It was suggested in this thread that the desired solution is to "always maximise on the the monitor that contains the majority of the window at the moment the user gives the maximise command." I think it would be more intuitive to always maximize the window to where the maximize preview is, and make sure that the maximize preview is in the correct location. For the window maximize/snap preview, the behavior is to maximize the window based on where the mouse is, not where the majority of the window is. I suppose you could classify the second example above as a separate bug, that when you move your mouse between different snap locations the snap preview doesn't update even though the location that the window actually maximizes to does. The issue only occurs when maximizing a Terminal with 2 or more tabs on the laptop screen and moving to another workspace. When returning the Terminal is in the External screen. This bug occurs in Ubuntu 12.10 too. I am using Compiz + Unity. Please fix it! It's really annoying. I would like to add that when the window is minimized to fit the screen of the smaller monitor it works correctly. > duplicate bug report (966547). (b) The height of the window is greater than the height of the monitor it's mostly on (and probably applies to width too). I still cannot reproduce the bug in any "natural" case where (c) a window smaller than the monitor it's on (and centred) fails to maximize on that monitor. That's the main case reported at the top of the bug and the main case that worries me. I can't reproduce it. Can anyone reproduce (c) any more or is it just (a) and (b) that are a problem? If you can reproduce this bug, particularly in case (c) above, please run "xrandr" and paste the output here. Here is a way to reproduce it 100% of the time. bigger in at least one dimension than the second monitor on the right. window push it against the panel (still showing the right maximize outline. fact it maximized on the larger left monitor instead. > it's mostly on (and probably applies to width too). > the main case that worries me. I can't reproduce it. wacked_up: That's case (b) I described above and can already reproduce. I don't remember ever encountering case (a), and I use Ubuntu 10 hours every day. I've been using Unity only since 12.04 though. Maybe case (a) has been already fixed since the original report (from 2011-04). No, cases (a) and (b) I have reproduced with the latest compiz 0.9.9 source. Daniel: Case (c) works for me, meaning small windows maximize correctly - it's *not* buggy here. Regarding (b), it's not just the height that triggers the bug, it's also the width: If any current window dimension doesn't fit onto the selected monitor, it maximizes to the other (larger) one instead. Daniel: my understanding is that case (b) is what we're seeing - I don't think I've seen (c). With two monitors of different size, it's very easy to get a window slightly larger than the smaller one. I am experiencing b). Like the original reporter, I have a laptop with an external monitor. To reproduce this, all I have to do is drag a window that was sized for the external monitor to the laptop monitor and maximize it. It's not an unnatural thing to do. I have to work around this bug multiple times a day. It is great to see this fixed. Awesome. Indeed, it is great to see a fix was committed. Will this fix be backported to compiz 9.7.x for all the Ubuntu 12.04 LTS users out there? Can anyone comment on two things? 1. What is the nature of the fix that was committed? Two proposals have been made. A: maximize window to display containing most of window's area. B: maximize window to display containing mouse. ...I hope the fix was implemented as option B, since that seems more like correct, unsurprising behavior. If someone is clicking on a titlebar button to maximize a window, or dragging a window against the top of the screen to maximize, their attention is on the display containing the mouse; and the window should go there. They are unlikely to know what proportion of the window is on what display. In fact one can easily have the majority of the window on a different display, e.g. in the case of maximizing a window to an external 800x600 projector connected to a 192x1200 laptop. 2. This fix appears to have been committed to compiz 0.9.8.8 SRU-2. Is it possible to determine whether that (or any other version of compiz with the fix) will make it into ubuntu 12.10? I'm never sure how to tell when or if to expect the fix to appear on my machine. Still present on fully updated ubuntu 12.10. If the window is larger than the monitor resolution it maximizes on the bigger monitor. If I resize the window so it's smaller than the monitor resolution it maximizes corectly. Please fix. 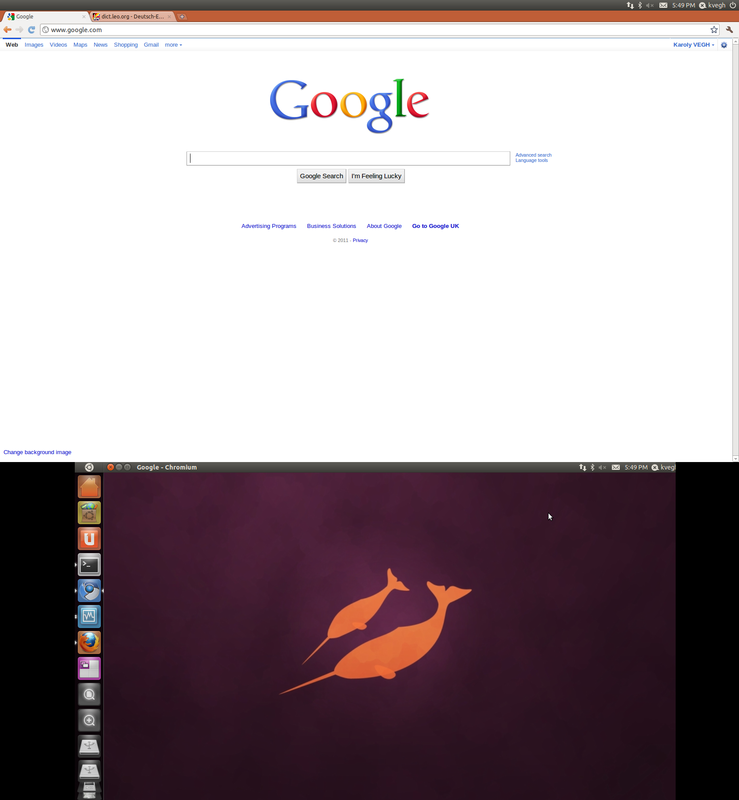 It's working fine for me in Ubuntu 13.04. I tested Nautilus, Chromium and a terminal window. I was not able to reproduce this with a Terminal window, but with firefox I get this strange effect when UNmaximizing a new window. When I open a new window of firefox, it opens maximized on the attached external monitor. When I click on "UnMaximize", it jumps to the laptop display. The effect appears only on newly opened firefox windows. Windows that have been 'used' already for resizing, etc. do not have this effect. The external monitor has 1920x1200 pixel and is positioned above the laptop monitor which has 1680x1050 pixel. I have this problem in Quantal and want to try the proposed compiz fix in #40. However, when I try to install the quantal/proposed version of compiz using apt or synaptic, it wants to uninstall ubuntu-desktop... obviously not good. How can I get around this conflict? danep: For testing the proposed update, I'd suggest you try updating only Compiz and not other -proposed packages, maybe there is something broken in the -proposed. One way to do that (I've found) is to enable proposed, look at Synaptic's upgradeable packages and sort the list by version number - it's easier that way to select all the compiz packages for updating at once, without causing dependency problems. Just scroll through to the around 1:0.9.8.6+bzr3433-0ubuntu1 (note that since there's "1:" it comes after all the non-: version numbers). Still an issue on Ubu16/Unity7. Can we fix this?